Have you ever wanted to wear that cute midriff, sleeveless shirt or two piece but never had the confidence to show off your skin because of stretch marks? Well, most probably, you’re not the only one. Having stretch marks is one of the common skin problems experienced by both men and women in their adulthood. These marks are caused by hormonal changes, fluctuation of weight or size, growth spurts and pregnancy among others. Stretch Marks appear more often in adults because the skin becomes less resilient and collagen production becomes slower as we age. 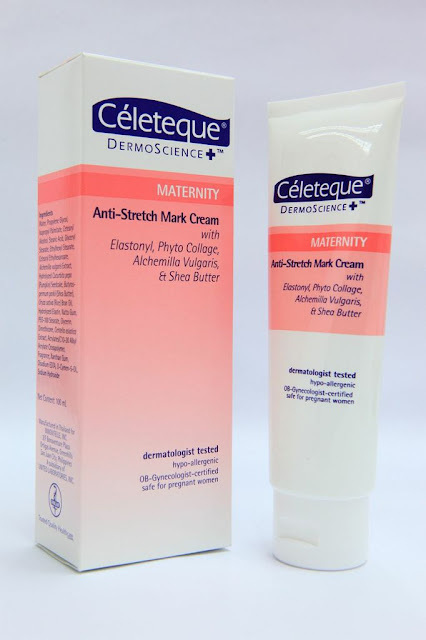 To help in the prevention of future stretch marks and reduction of existing ones, Céleteque DermoScience now has the Maternity Anti-Stretch Mark Cream. The Maternity Anti-Stretch Mark Cream has skin firming agents such as Elastonyl and Alchemilla vulgaris extract that help protect and restore the tone and elasticity of the skin. It also has effective moisturizers such as Phyto Collage and Shea Butter to help skin become more pliant or stretchable. Just apply the product liberally using circular motions on stretch mark prone areas such as the abdomen, the arms, hips and thighs and for best results, use it both in the morning and evening. Céleteque DermoScience products are available at Watson’s, SM Department Stores, and Robinson’s Department Store. Suggested Retail Price: Php 445.00also and can also be purchased online.